Finally. This word was the most appropriate term to characterize the 2009 Grand Alumni Homecoming for a Cause of the Education High School last October 25, 2009 (Sunday), at the Sycip-Velayo Multi-Purpose Halls. 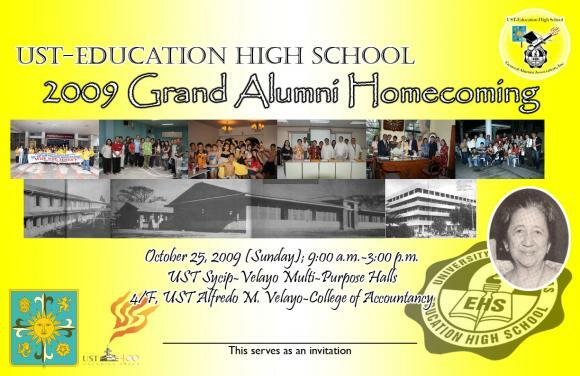 The event was the culminating activity of the revived UST-EHS General Alumni Association, Inc., for its inaugural year of 2008-2009. Gathering a total of 426 alumni from all decades of the EHS (1950s-2000s), the event saw the alumni reunite with their old friends, and forge ties with new friends. Commencing the event was a Eucharistic Celebration officiated by Rev. Fr. Erning Lagasca, OFM Capuchin. This was followed by a Fellowship Luncheon at the corridors of the Alfredo M. Velayo College of Accountancy. Come 1:30 p.m., the Special Show began, with the Roll Call of Classes 1952-2009 kicking-off the festivities. Each represented batch was enjoined to distinctly make their presence known, with one batch even doing their own rendition of the popular “Nobody, nobody, but you.” The crowd erupted with deafening chants of “Mayor, Mayor” when Class 1978 alumnus Albert Martinez stood with his batchmates when their batch was called. The Class Jubilarians were also called and awarded, with each batch representative regaling the audience with a funny anecdote or two about his/her high-school days at EHS. In his welcome address, EHSGAAI President Emmanuel German V. Plan II stressed the point that it is high time for the EHS alumni to be recognized for what they have contributed to the society. But while the alumni have fulfilled the “E” (Excel), he said, the alumni should not also forget the “H” and the “S”—Help and Serve. Also recognized were the Love Couples of the Education High School—those EHS alumni who got married and are still going strong together. Rev. Fr. Romulo V. Rodriguez, O.P. (EHS Regent) & Rev. Fr. Lagasca, OFM officiated the Renewal of the Matrimonial Vows of the recognized couples. Class 1971 was also recognized for their pioneering efforts in organizing the 2008 Grand Alumni Homecoming, while Mr. Eduardo F. Nepomuceno was given the Service Award for serving as the Immediate Past President of the EHS Alumni Association. Ms. Helen Vela, Valedictorian of Class 1962, was also given the Posthumous Totus Tuus Award in recognition of her excellence and love for the EHS during her lifetime. Assoc. Prof. Marishirl P. Tropicales (EHS Principal) gave a “State of EHS Address” to the alumni, briefing about the current status of EHS in terms of academics, activities, etc. Fr. Rodriguez, on the other hand, also gave an update about the EHS and briefed the alumni on how they can best give back to their alma mater. Assoc. Prof. Ma. Mercedes C. Buendia, Assistant Director of the Office for Alumni Relations, meanwhile, announced to the alumni body the upcoming alumni activities of the University. To cap the event, Coll. John M. Simon, 2009 Grand Alumni Homecoming Co-Chair, prompted the attendees to look outside the windows of the Halls to the Education High School and announced the Grand Launch of EHS’ Diamond Jubilee Year Celebration. To commemorate this, a huge tarpaulin was rolled down from the fourth floor of the Albertus Magnus Building, where the EHS is located. The event’s beneficiaries included the UST-Education High School and the Gambala family, whom the UST-EHSGAAI is assisting in rehabilitating their lost home due to typhoon Ondoy. Mr. Philippe Jose S. Hernandez and Ms. Myra S. Morandarte of Batch 2007 hosted the event.